Twister TFP3062 6 x 12 ft. Table - G & W Machinery Sales, Inc.
TFP3062 30kw (150Amp) 6x12 table, with FANUC 0i-MC CNC. The TFP6062 has twice the cutting power with its 300 Amp (60kw) torch. The maximum steel cutting thickness for the 30kw (150Amp) plasma torch is one inch. To extend the maximum cutting thickness to 2 inches, an oxy propane torch attachment is available. See the descripion of the Oxy Propane Attachment Option and the video of switching from plasma cutting to oxyfuel cutting by clicking here. The Twister TFP3062 is a larger table version of the TFP3051. It is similar in design and has the new FANUC 0im CNC and other features available on the new model TFP3051 Mark IIIa. 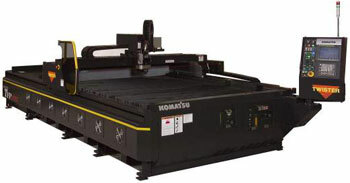 The TFP3062 features a 6 ft. x 12 ft. cutting area and 30 kW (150 Amp) Fine Plasma torch. If you need larger table sizes or more power, check out the Twister TFPL Blade featuring table widths of 8 or 10 feet, in 20 or 40 foot lengths, with either the 30 kW, 60 kW (300 Amp), or 100 kW (525 Amp) Fine Plasma torch. Technology in the Twister TFP3051, TFP3062, TFP6062, and TFPL Blade Series is protected by US Patents, and other Patents Pending.